With the Bandits locking up the third and final playoff spot in the Eastern Division Saturday with the 17-9 victory at home against the Vancouver Stealth, the Buffalo Bandits were playing for pride and a little bit of revenge against the New England Black Wolves Sunday night at the Mohegan Sun Arena. With New England winning the first two contests and both teams having back-to-back games for the weekend, the depth of each team’s roster and the physical stamina they carried into the contest were the key factors that decided into the Bandits 20-9 victory over the Black Wolves. Bandits forward Mark Steenhuis’ scoring prowess was once again put on full display as he set a new Bandits season high with 11 points (5G, 6A). Ryan Benesch was second in team scoring with eight points (4G, 4A). 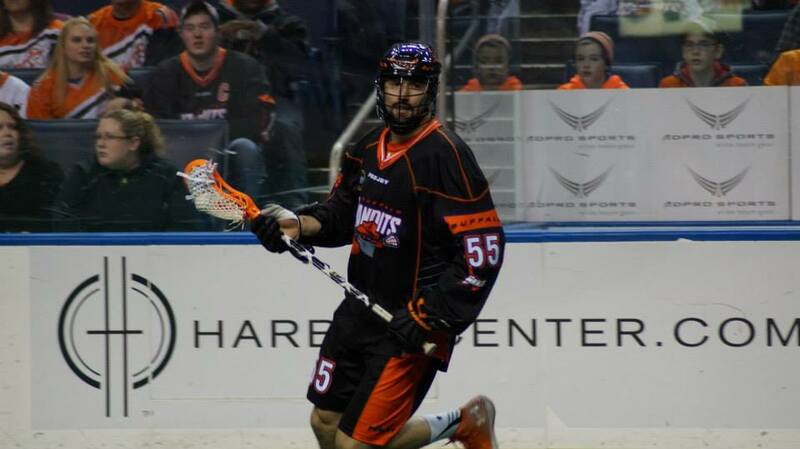 The four goals scored during the game helped propel Benesch to the top of the Bandits all-time leader boards in goals scored within a season with 52 goals topping Bandits legend John Tavares. Both Dhane Smith (2G, 5A) and Alex Kedoh Hill (3G, 4A) tied for third in team scoring with seven points apiece. On the other side of the coin, the Black Wolves Garrett Billings led the way for the Black Wolves with five points (5A) while Josh Johnson (1G, 2A) Kevin Buchanan (1G, 2A) and Kyle Buchanan (2G, 1A) each tallied three points in the loss. In the battle between the pipes, Anthony Cosmo came up with another huge game for the Bandits as he racked up 40 saves on 49 shots. For the Black Wolves, their goaltending woes continued as their starter Evan Kirk came up with only 25 saves on 41 shots in the loss while backup Tye Belanger actually looked solid with 9 saves on 13 shots in almost 12 minutes of game action. In the first quarter it was a pretty tight game overall with Buffalo looking to stun their opponents early on in the contest by going on a two goal with tallies from Smith and Mitch Jones with less than three minutes off the clock. For the rest of the first quarter, both the Bandits and Black Wolves battled hard back and forth with each team in a scoring tug of war with neither team relenting to the other. New England’s Josh Johnson would get the Black Wolves on the board less than a minute after the goal by Jones to get the Black Wolves within one goal of the lead. For the next 12 minutes, the Bandits would receive goals from Benesch, Kedoh Hill, Steenhuis and Brownell while the Black Wolves would pull back with goals from Kyle Buchanan, Mark Cockerton and former Bandits Jimmy Purves. With the Bandits having the two goal lead to start the second quarter it was Jimmy Purves who opened the scoring for the Black Wolves keeping New England within one goal of the lead. Jones would receive his second goal of the game for the Bandits when he received the pass from Dhane Smith less than 30 seconds after the Purves goal to keep the Bandits ahead by two. Less than a minute later, Kevin Buchanan would receive a beautiful feed from Kyle Buchanan to keep the Black Wolves within one goal again at 7-6. Looking to shift the game into second gear, the Bandits created some much needed distance between the Black Wolves and the lead by going on a three goal run from Kedoh Hill, Steenhuis and transition specialist Nick Weiss capping off the run and incidentally the game winning goal at the 7:02 mark of the second quarter. Seeing the Bandits slowly starting to pull away with the lead, Black Wolves forward Brett Bucktooth got his team back on the scoreboard and within three of the Bandits 10-7 lead. Benesch and Weiss would each get their second goals of the game with less than five minutes remaining in the second quarter. Not wanting to end the half on a bad note Kyle Buchanan received the last tally of the first half for New England on a screen shot past Cosmo and down four goals 12-8 to the Bandits. When lacrosse teams do back-to-back games, the physical toll of just one game can do to a player but then adding on top of that the punishment of playing a second game the next day along with long flights or bus trips back home only to get minimal sleep will truly show who is the most adapt to survive in the NLL. With the Black Wolves looking absolutely gassed physically in the end of the second quarter, the Bandits knew that heading into the next 30 minutes of the game they would need a relentless combination of speed, grit, determination and a little bit of continued scoring touch to put the Black Wolves away for good. The Bandits came charging hard out of the gates immediately into the third with a six goal knockout punch to the Black Wolves that would last the entire third quarter and midway into the fourth. Benesch, Kedoh Hill and Steenhuis would lead the Bandits to the promise land with two goals from Benesch including his team record 52nd goal of the year, Kedoh Hill with his third goal of the game midway through the third and Steenhuis with his third, fourth and fifth goals of the game. With the Bandits up 18-8, Black Wolves defensemen helped the team save a little face by scoring their only goal in the fourth and keeping the Bandits lead to nine goals. With less than three minutes remaining in the game, Buffalo would go on one last two goal run with goals from Jones and Smith to end the game at a brutal 20-9 score in favor of the Bandits in the Black Wolves final game at home in their inaugural season. Looking to end their regular season on a high note the Bandits will try to make it three in a row and tie up their season series with the Black Wolves for “Fan Appreciation Night” next Saturday May 2nd at the First Niagara Center.